A French woman who was taken hostage in Yemen in February has arrived in Paris after being freed by her captors. 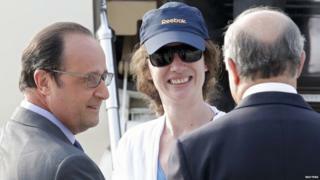 Isabelle Prime, 30, touched down at Villacoublay air base on Friday where she was greeted by her family and the French President Francois Hollande. Foreign Minister Laurent Fabius said France had not paid a ransom, but singled out Oman for its "enormous help" in securing her release. Ms Prime was working as a consultant on a World Bank-funded project in Yemen. She was captured, along with her translator Sherine Makkaoui, as they made their way to the capital Sanaa on 24 February. Ms Makkaoui was released in March. The identity of their kidnappers has not been confirmed. Ms Prime's father Jean-Noel said he was "unbelievably happy" to have his daughter back. "She's in good health but I don't have any further details," he told the AFP news agency. In June, France said that a video showing Ms Prime clearly in in distress was authentic. Dressed in black, she appealed to President Francois Hollande and the Yemeni authorities to arrange her release because she was "really, really tired". "I tried to kill myself several times because I know you will not co-operate and I totally understand." Oman News Agency said the country had played a role in negotiating her freedom in co-ordination with "some Yemeni parties", after a request from the French government. No other details of the release were given. Oman, which borders Yemen, has helped to facilitate the release of other captives, including American journalist Casey Coombs, who was freed by Shia Houthi rebels earlier this year. In recent years tribesmen in Yemen have kidnapped foreigners as a means of putting pressure on the government to provide them with better services or to release jailed relatives. More than 3,000 people have been killed since a Saudi Arabian-led coalition began air strikes in March to drive back Houthi rebels. Aid agencies say a Saudi-enforced sea and air blockade on the country has worsened the humanitarian crisis after months of conflict. More than 80% of Yemen's 25 million people now need some form of aid. The fighting has also caused huge damage to the country's infrastructure, and the blockade has caused severe shortages of food, water, medicine and fuel.